In addition to being used on public highways to guide pedestrians along footpaths to safe crossing points, the many uses of Alpha Rail pedestrian guardrail goes above and beyond. Previous projects have presented requirements where a client has a need for an off-highway solution, where pedestrian guardrail was installed in stockyards, factories, warehouses and loading bays. The installation of pedestrian guardrail in these environments is ideal where there is a need to segregate on-site personnel from forklifts, lorries and other moving machinery that could potentially be a health and safety risk. Alpha Rail pedestrian guardrail is kept in stock at all times and a choice of different styles are available, including full height and sight-gap panels. Customer requirements can be reacted to quickly and turnaround times are as fast as possible – they are a cheap and effective barrier and have a hot dipped galvanised finish as standard. Whilst stock panels are made to be rooted (concreted in), base plated panels can be easily manufactured to be surface mounted, which is common when being installed inside the fabric of a building. Where there is a need for increased visibility, we are pleased to offer polyester powder coating in an extensive choice of RAL colours. 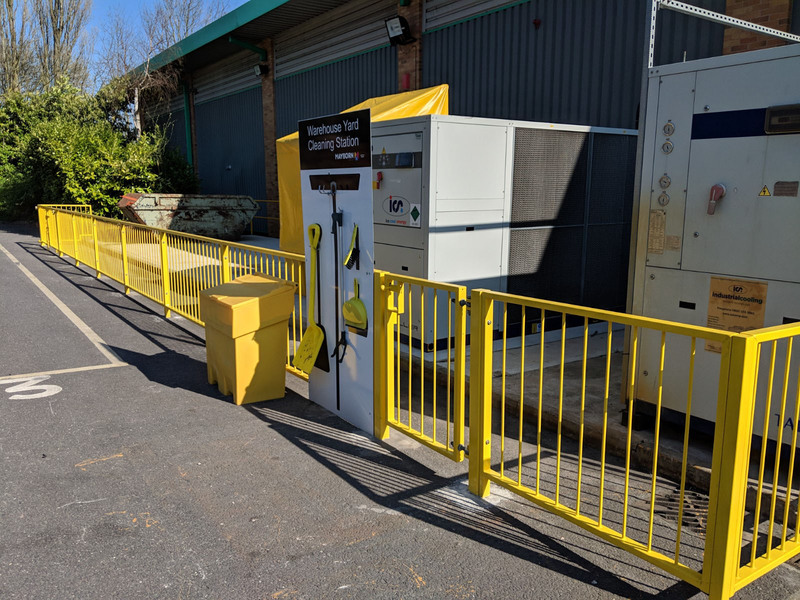 Alpha Rail has supplied and installed metalwork in bright colours such as yellow, blue and red, all of which would aid greatly in making the barriers stand out in their environment. Recently, Alpha Rail has returned to a logistics site in Mansfield, where we previously installed pedestrian guardrail to serve as a barrier between personnel and vehicles unloading deliveries. Proving to be the perfect solution, a further 17 linear metres of the same product has been installed in another area at the site, along with two gates to match. This was polyester powder coated in RAL 1023 Traffic Yellow. The newly installed metalwork will demarcate the area where the skip is loaded and unloaded, along with protecting the industrial temperature control machinery. Please visit our website to view previous examples of pedestrian guardrail projects across the country.